You guys are definitely in this blogger's thoughts and prayers this weekend. I'm now hearing that Hurricane Gustav has gone from a tropical storm all the way to a Category 4 within the space of the past 12 hours. That in the past 3 hours alone the central pressure has dropped 9 millibars and Gustav still hasn't hit the warmer Gulf waters yet. The projected tracks also have the storm going west of New Orleans. If the east side of the storm gets too close, the town which is still cleaning up after Katrina three years ago will likely get hit even worse this time around. Lord willing, this thing will fizzle-out into a relatively weak system (it's happened before). Three years ago I went nuts chronicling Katrina on this blog, and truth be known I'm still a bit burned-out by the experience. It's not something that I want to have to do again. But if it does hit, hopefully there will have been much that was learned from the mistakes of Katrina that will make Gustav a much less traumatic event. 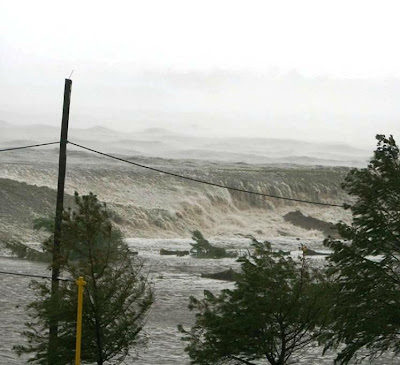 This is the storm surge itself of Hurricane Katrina, as it came ashore near New Orleans. I can't recall anyone else photographing the surge of any hurricane in such up-close detail. That is pretty much a mountain of water dozens of feet high as it's crashing down onto the shore. For this and other pictures in the series click here.